If you are experiencing ankle pain when walking or running, you should know that there are several variables at play in the ankle. The pain can be coming from the ankle joint itself or from the tendons that run through it. Read on to learn more about the ankle joint and how you can deal with pain. The ankle joint is like a hinge that opens and closes. Pain in that joint can be the result of a trauma or injury to the joint or a disease that causes the joint to degenerate, like arthritis. Ankle sprains are common, and are often the result of twisting an ankle while walking, sometimes because of wearing unstable shoes. These can be mild and resolve quickly, or can cause pain and problems for an extended period of time. The term Tendonitis refers to an inflammation of a tendon – in this case, we are discussing the ankle. The ankle joint is shaped like a hinge. It opens and closes to move the foot away from the body and toward the body. The joint is formed at the place where three bones meet: the tibia, the fibula, and the talus. The tibia and fibula are the two bones in the lower leg, and the talus is a large bone in the foot. The two bumps that you see on the sides of your ankle are called malleoli. Their purpose is to stabilize the ankle joint. In addition to the malleoli, there are ligaments on either side of the ankle that give stability to the joint. They help to strap the ankle into place. The Achilles tendon is a large tendon in the calf. It wraps behind the ankle and attaches to the back of the heel. 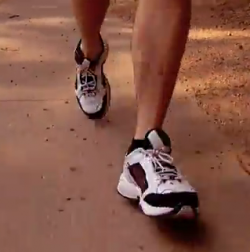 What Causes Ankle Pain When Walking / Running? One of the most common causes of ankle pain is a strain. A strain is an injury to the ligaments in the ankle. When the ligament is stretched abruptly or stretched too far (as often happens when a person twists an ankle due to stepping on an uneven surface), the ligament can tear partially or completely. If you have had a previous ankle injury or the muscle there is weakened for any reason, you are more likely to develop an ankle strain. If you strain your ankle, you may hear a popping and sound and immediately experience severe pain. The area may quickly become swollen and be painful to move. Treating an ankle strain includes ice, anti-inflammatory medication (on advice from a pharmacist/doctor), elevating the injured area, and reducing weight-bearing activities. Tendonitis is a term that refers to inflammation of a tendon. It can occur in any tendon in the body, but when it is located in the ankle area, it is often the Achilles tendon. Achilles tendonitis can be caused by inflammatory diseases or acute sports injuries. Treatment for tendonitis is similar to treatment for ankle strains, including ice, anti-inflammatory medication (advice as before), elevating the injured area, and reducing weight-bearing activities. You may need to avoid sports until the inflammation has resolved. If the tendon ruptures, surgery may be required. If you are experiencing ankle pain, there are a variety of steps that you can take to make yourself more comfortable. Follow the advice and direction of your doctor. Also, wear shoes that provide support to your ankle. When the muscle or tendons or weakened, it is particularly important that you wear shoes that will add stability and support the ankle in order to prevent further injury. Wearing a customized arch support, or a suitable over the counter arch support, will further help to stabilize the foot & ankle joint. Visit Foot Solutions UK for a free foot & gait analysis. We carry a wide range of supportive footwear & arch supports . Call in to one of our stores & let us help you to find the solution that you need to help minimise your ankle pain & get you back doing the activities that you enjoy.